Take your truck performance to the next level! Engineered using the same industry-leading shock technology found in SCORE, CORR, Dakar and WRC racing, the Eibach PRO-TRUCK shocks deliver maximum performance on or off-road. Eibach PRO-TRUCK Sport shocks are built to tackle any road. For vehicles with factory front coilover configurations, we offer PRO-TRUCK Sport Leveling (RHA), with front ride height adjustability up to 2.5” (depending on application), allowing you to go with a bigger wheel and tire combo and clear most obstacles on the trail. Unlike “spacer” type lifts, the Eibach PRO-TRUCK Sport Leveling Shocks are designed to maximize all available wheel travel for a smoother ride when the “Going Gets Tough”! 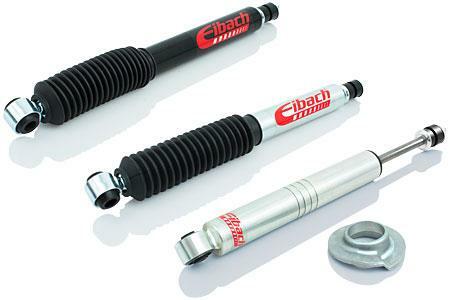 Until you have driven a Truck or SUV equipped with Eibach PRO-TRUCK shocks, you will not believe the transformation in handling and performance—all without sacrificing ride quality. All PRO-TRUCK Shocks are made by Eibach and dyno tested for quality and performance. Stock or slightly lifted, we have the right performance shocks for your truck or SUV. Perfect performance upgrade for your stock truck or SUV with original equipment shocks and standard ride height. Maximum performance for standard to moderately lifted trucks with larger wheels and tires. Built to handle the extreme forces with more Off-Road performance in mind. The same maximum performance as our PRO-TRUCK Sport shocks, with added front ride height adjustability for vehicles with factory front coilover shock configurations.